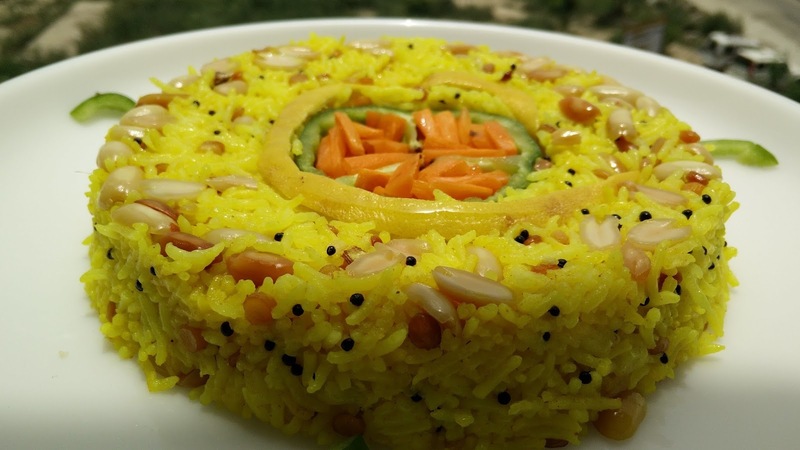 Lemon Rice, the name itself brings the flavor of lemon in mouth. It is an authentic South Indian Recipe which is very easy and quick to make. Just need boiled or steamed rice and little more spices to add to tangy flavor of Lemon. Take boiled rice, add turmeric powder and 1 tsp of oil. Mix well to get a nice colour. In a Kadai/pan, splutter mustard seeds, add both dals, hing, ground nuts. Cook for 5 min and add rice. Cook on medium flame for 5 min and allow it to cool down. Once cool, add lemon juice to the rice and mix well. For garnishing, take a microwave safe bowl, place a ring of capsicum in centre and fill the sliced carrots in the holes of the capsicum. Spread the groundnuts all over the bowl and put the rice over it. Press gently so that the rice take the shape of the bowl. Microwave for 2 min. Take serving dish and place the bowl upside down. Serve hot with curd.